I'll admit that I didn't really know what to do with my newly accomplished, 100% from scratch tofu. It seemed too much work to just do ordinary things with it; it felt as if I needed to fuss and create something new and exciting which is what ended up happening around lunchtime today. As I stood with steaming, crunchy, soft, sweet, salty tofu in hand, I knew I hit the mark. And the inspiration came from my cookbook shelf. I seem to go in "cookbook jags", rereading books that I have in my collection and then kind of cooking my way through them, in my own fashion of course, long after I've acquired them. I can follow instructions, but I would say (outside of testing written recipes) I have only loosely followed instructions for the past couple of years. The recipes in this book perfectly complement my experimental outlook in cooking life, and they end up being pretty healthy as well. The gist of the book is to hide pureed vegetables in "kid-friendly" foods. The trouble with my kid is that he doesn't like "kid-friendly" foods, so most of this book tantalizes me but no one else in my family. I am happy he won't go anywhere near a soda or a chicken nugget, but I have a harder time of hiding veggies in anything that isn't a direct descendant of a carbohydrate. The best I can do is to veg-pack the pizza sauce that goes on our homemade pizzas that I try to make once a week. I take an abnormal amount of pride that my kid only eats sauce pizza. I bolster it with any red vegetable and even a sneaky carrot or two. It's nothing the pinch of sugar and plenty of oregano can't fool his tastebuds with. Last night at dinner, I steamed a little extra broccoli with the express notion that I would puree some of it to include in a hidden-veg recipe. Broccoli, strangely, is one of the vegetables my son will eat without question - so I also knew I was going to be doing some experiment for myself. I ended up using it with my very own, soft set tofu. I was shocked at both its hidden flavor and adhesive qualities. I thought for sure the whole outer coating would slide right off the slippery tofu, but it did not... and the creamy interior was such an amazing texture I just stood alone in my kitchen muttering aloud just how good it was. Next time, I may play around more with the spices but really, this is a pretty amazing little starter for a vegetarian meal. My homemade tofu is much softer than the local, commercial tofu that I have bought, though I am sure commercial tofu is a fine substitute. I also used my own sourdough bread crumbs, that I grind very fine. Any fine dried bread crumb is a good bet. I also used something for the dipping sauce I fondly refer to as "Volger Sauce". I'll explain that below. I did have to work carefully with the homemade tofu, it was delicate and would break if I wasn't so careful. But that said, I was surprised at the sturdiness of these after pan frying them. 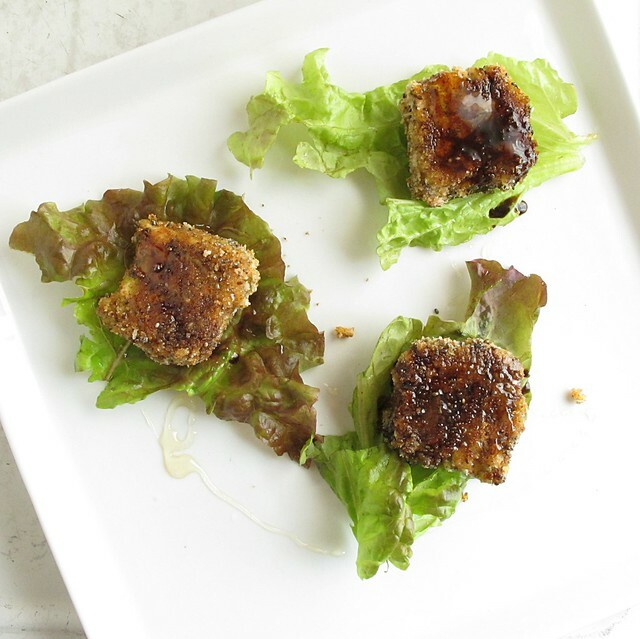 If you were the putzy type, you could probably wrap the whole tofu nugget entirely in a lettuce leaf (endive, butter lettuce?) and secure it with a toothpick - but eating them hot like little lettuce/tofu tacos was pretty unbeatable, and had the bonus of keeping my fingers relatively clean. Cut the tofu gently into 1/2 inch thick slices and cut into large sized cube shapes. 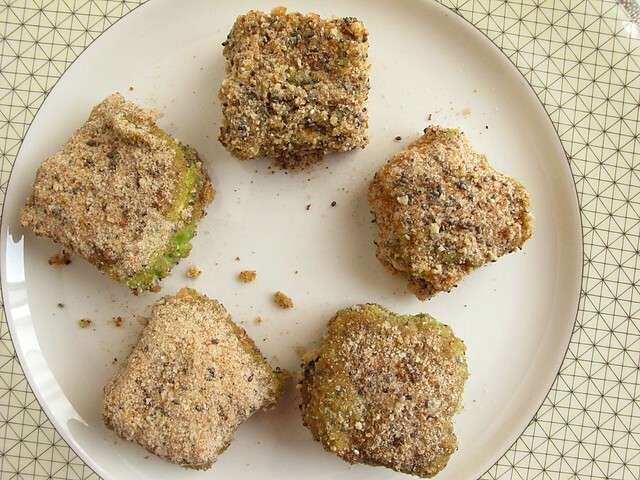 Toss the breadcrumbs and chia seeds together in a medium sized, shallow bowl. 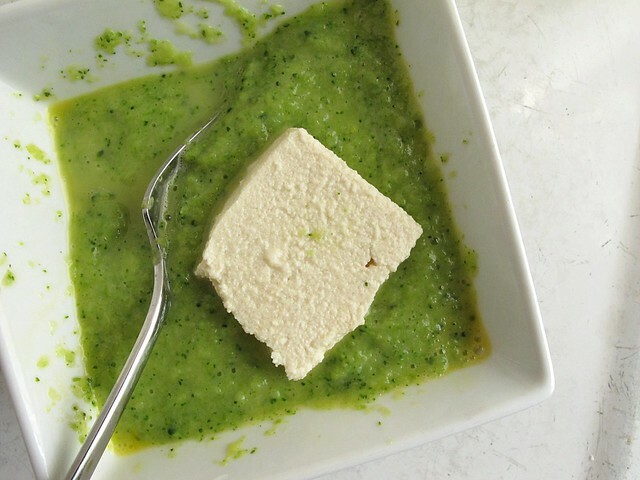 Combine the egg and broccoli puree in a small bowl. 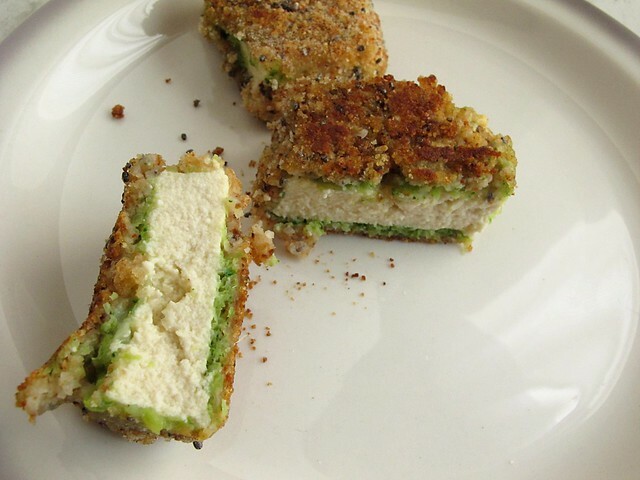 Dip the tofu pieces one at a time in the broccoli puree/egg mixture and turn to coat it completely. With a fork, carefully lift it into the breadcrumb mixture and use a spoon to help coat it completely. Use a fork to carefully transfer it to a plate and repeat with remaining pieces of tofu. Heat a non-stick skillet over medium heat. 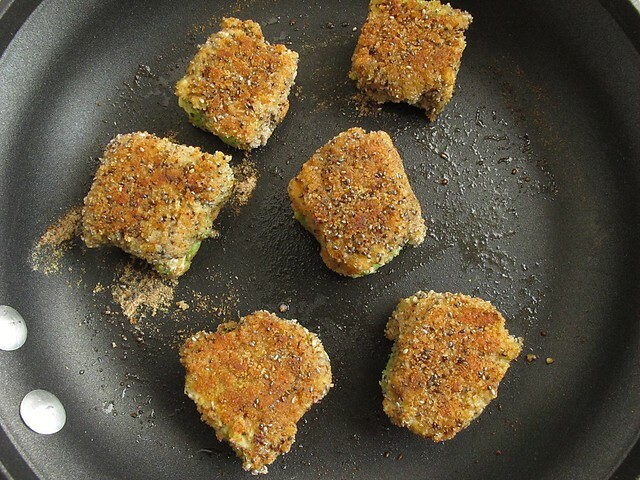 When hot enough to sizzle a drop of water, add 1 T. of olive oil and add half (5) of the dredged tofu nuggets. Pan fry 3-4 minutes on the first side, carefully flip and continue frying for about 3 minutes longer. The tofu will be nicely browned and will feel firm. 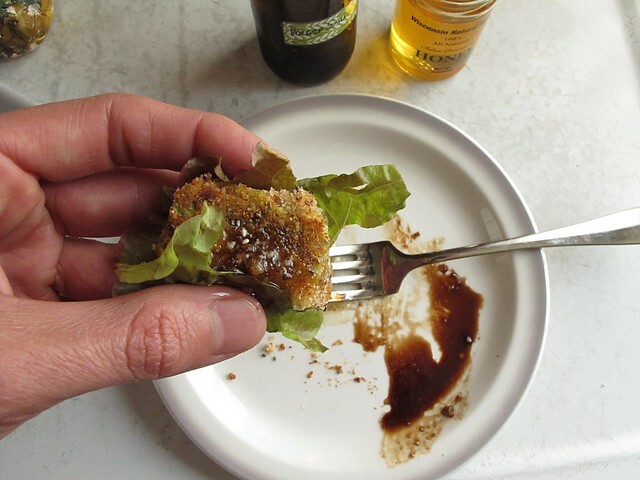 Serve on lettuce leaves with equal parts Volger Sauce and good honey. To make it, combine 1/4 c. pomegranate molasses (I use this from POM, which may make it a tad thinner), 1/4 c. soy sauce, tamari or shoyu, 1 tablespoon molasses and 1 teaspoon of toasted sesame oil. Shake it up, store in the fridge, and use it on all kinds of stuff. Kindly pay his web site a visit too, there is all kinds of greatness going on over there. I love when lunches appear like this, even though this lunch was pretty light and that's why I've considered it an appetizer. I have always held lunch in very high regard, if only because for the better part of the last 6 years, I can make whatever my heart desires. The liberating freedom that comes from cooking for only me is something I treasure, and when something is a success, the victory is all the sweeter.